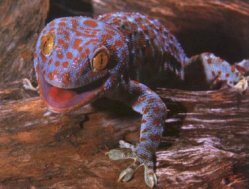 The asthmatic Gecko had cough and asthma which made it hard to breathe(LU) and live (KD). He was finally cured when he found that long hours of sitting outside on the sunny side of the hill would help him augment essence and blood. Pharmacologically Ge Jie is an immunostimulant which is also associated with increased production of adrenocortical hormone. It relaxes Bronchii and has a marked antiasthmatic property. The tail and body are used, though some say the tail of Ge Jie is more potent.